Heat the oil and butter in a frying pan and then add the leeks, onions and garlic and sauté over a low heat for 5 minutes. Using a medium saucepan, pour the chicken stock over the frozen peas and boil gently for ten minutes. Add the onion mixture to the boiled peas. Remove from the heat and use a blender to process the soup as finely as you can. Pass the soup through a fine sieve and discard the dry pulp. Transfer the soup back to the pot and reheat gently. Taste and adjust the seasoning. Thicken the soup with the corn flour mixture and then stir in the sour cream. 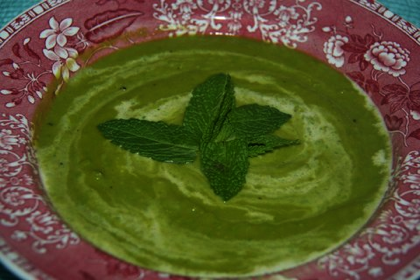 Pour the soup into serving bowls topped with mint leaves and and crème fraîche.